"I wouldn't think of making a big pot of stew without taking it to my neighbors"
(CNN) -- Leslie Gage knew it was coming, but that didn't take away the pain. 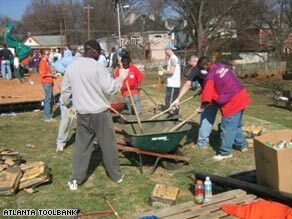 Atlanta Community ToolBank volunteers build playground, and relationships, in their community. She was working as an architect for a small company in Atlanta, Georgia, when the company's founder asked her into his office. He took off his glasses and rubbed his hand against his forehead. "We just can't afford to keep you ..."
Gage doesn't remember what he said next. She does remember what followed for her: denial, depression and long days of watching cable TV alone at home. She eventually joined a nonprofit group that renovated homes in her neighborhood, but she also built something else -- a place in her community. Now she wonders whether more Americans will arrive at the same conclusion that she has: We have to rebuild our sense of community, not just our banking system, if we're going to survive. "This is when we're going to define ourselves for future generations," Gage said. "Are we the type that turn inward, or are we the type that turn outward and help one another?" The answer to Gage's question is mixed: Some Americans are turning to community while others are retreating to their cocoons. According to one perspective, more Americans turn to their remote, not their neighbor, in bad times. Netflix officials reported a 45 percent jump in profits during the end of 2008. Gross movie ticket sales are up 18.8 percent this year, according to BOXOfficeMojo.com. And home entertainment business sales are surging, according to sales figures. Yet there are other signs that the economy is also inspiring Americans to turn to one another for everything from solace to stew. Nonprofit groups report a surge in volunteers. Peace Corps applications are up 16 percent from last year. Online applications for AmericCorps, a federal program where volunteers tutor needy children and build housing for the poor, have increased three times faster than a year ago. Americans have long prided themselves on being a self-reliant, pull-yourself-up-by-your-bootstraps kind of people. But there's another part of the nation's character that's as old as farmers looking out for their neighbor's home on the frontier that seems to be spreading across the country, some say. Thousands of Americans have organized Economic Recovery House Meetings in 50 states at the urging of President Obama to talk about the stimulus plan and help one another get through the economic crisis. Claire Anderson, who organized one of those house meetings in Seattle, Washington, said people have have established barter networks, organized lending networks and planted community gardens. Bad times make good neighbors, she said. "I hear people say I make more dinners for my neighbors way more than I did five years ago when I didn't even talk to them," Anderson said. Anderson said she's inspired by reading stories of how Americans acted during the Great Depression. They weren't too proud to ask for or give help. "Now I wouldn't think of making a big pot of stew without taking it to my neighbors," she said. The duty to one's neighbor is a fundamental belief in most religions. It would seem natural that more people would turn to their church, mosque or synagogue for community in tough times. But don't expect a shaky economy to lead to a national religious awakening, said Nancy Dallavalle, chair of the Department of Religious Studies at Fairfield University in Fairfield, Connecticut. While individual communities of worship may see some uptick in their numbers, Dallavalle said fewer Americans depend on traditional religion for support. Some studies reinforce her point. According to the American Religious Identification Survey (ARIS), almost all religious denominations have lost members since 1990. Membership in mainline Protestant denominations has fallen for the past 30 years and has been widely documented. Dallavalle says most Americans will turn to pop culture rather than the church for inspiration.The infomercial that promises wealth or the Reality TV makeover show -- more Americans will turn to these for inspiration, she said. The Internet also siphons people away from traditional religious communities during tough times, she said. Americans who have grown up outside organized religion prefer to get their inspiration through the Internet: online motivational tracts, inspirational speakers and self-help gurus. "Folks might not turn to God as much as they turn to Google," she said. Whether people turn to God or Google, this economic crisis will shift people's values, said Melissa Harris-Lacewell, a commentator and political science professor at Princeton University. "Having less immediately forces us to decide what we value," she said. "Our priorities in times of crisis reveal our core beliefs." An economic crisis may even cause Americans to rethink what's worth admiring, she said. Instead of watching the "Real Housewives of Orange County," more might become drawn to the real families of ordinary America where couples lose jobs and get sick, but they still stick together, she said. "We say that people are valuable based on what they can produce, and now we see huge portions of our country that are unable to consume in the ways they previously had," Harris-Lacewell said. "We'll have to create a new measuring stick of what makes us valuable as people." Gage, the Atlanta architect, had to do the same for herself. After she was laid off, she experienced an emotional tailspin. For several weeks, she refused to apply for unemployment benefits because she didn't want to get more depressed shuffling along an unemployment line. "I didn't have the motivation to get up and go," she said. Then she volunteered at the Atlanta Community ToolBank. The nonprofit group lends tools and renovates home for the elderly and disabled. She quickly realized that people weren't just inviting her into their homes. They were inviting her into their lives. She still remembers the first neighbor she visited on behalf of ToolBank. The woman offered her breakfast in her living room and directed Gage's attention to her "Wall of Fame," which held portraits of her children. "She had 13 children -- all of them grown and several with college degrees," Gage said. "She was so proud of each and every one of them because, as she said, education of any kind was hard to come by when she was a girl. ... I won't ever forget that." Gage's story may be touching, but it doesn't mean it fits into a larger pattern, said one influential sociologist. Robert Putnam is the author of "Bowling Alone," a 2000 book that argued that many Americans are living more isolated lives. The book concluded, after wide-ranging interviews and numerous studies, that Americans belong to fewer civic groups, know their neighbors less and meet less often with family and friends. That solitary impulse in Americans actually gets worse during hard economic times, Putnam said. He said economic uncertainty has an "awful" effect on social connections because people become depressed and lose their sense of self-esteem when they lose a job, he said. One study looking at the Great Depression demonstrated this, Putnam said. He said that civic engagement, measured by involvement in groups such as local PTA groups and Elks lodges, steadily rose in the U.S. from the turn of the 20th century. But between 1930 and 1935, during the height of the Great Depression, many civic organizations lost half of their membership, he said. "Almost everybody believes that during the [Great] Depression that everyone got cuddled up next to each other and said 'we're all in this together'," Putnam said. "I'm not denying that some of that occurred, but what's more typical is that people hunker down and pull in." Americans eventually recovered their engagement in community. He said the country's greatest civic book occurred between 1940 and 1965. That boom was driven by The Greatest Generation, the men and women who came of age during World War II. "They had just been exposed to five years of war bond drives, scrap metal drives and Boy Scouts asking people to give up rubber mats in their car for the war," Putnam said. "They lived with a sustained notion of we're all in this together." Perhaps that will happen now. Gage said she's already seen it happen in the U.S. before. Gage lived in New Orleans, Louisiana, in 2005 when Hurricane Katrina demolished much of the city. What she remembers most is not what was destroyed by Katrina, but what was borne out of it: a luminous sense of community. As she walked through the neighborhoods, she said she kept encountering people who were cleaning up and looking to help others. "People I had never seen before were asking me, 'Do you need any help? How are things going with you?' Do you need any help moving that refrigerator?' And they were serious. It was all over the city and I heard the same stories." Gage has since found a new job at an eco-friendly architectural firm in Atlanta. But her memories of her neighbors in New Orleans, and the people she met through the ToolBank, convinces her that Americans won't live by Netflix alone in the days ahead. "It was a tough time, but I saw the entire city come together," Gage said. "I don't see why we can't do that."